Hello! My name is Jamshed and I’m the manager of the Easirent Shrewsbury branch. With my team I welcome you to our car hire centre in the beautiful market town of Shrewsbury. Located just off the A49, we are only 10 minutes away from Shrewsbury train station and we have a large selection of new cars all available to hire. 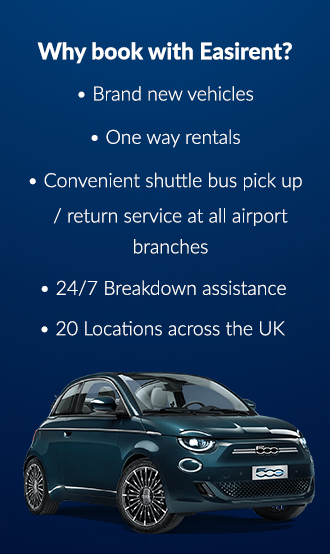 If you have any Shrewsbury car hire questions then please call me on 01733 297967 or if you are looking for the lowest price for car rental then book direct on our website. Arriving at Easirent Shrewsbury. The branch address Dale House, Ennerdale Road, Shrewsbury, SY1 3LD. Directions when travelling from the M6 south: Head North West along the M6 motorway. Look for the M54 turn off to Wales/Telford/Shrewsbury making sure you stay on the left hand fork. Continue along the M54/A5 for 22 miles then look for the A49 to Ainsdale drive in Shrewsbury. After 7 miles take the 2nd exit at Preston Island on to the A49 where at the next roundabout (1.6 miles) take the 1st exit on to Sundorne Road/B5602. Continue until the next roundabout where you should leave on the 3rd exit on to Featherbed Lane. Proceed on to Harlescott Lane for 0.3 miles when at the roundabout you should leave on the 1st exit towards Brixton Way. Turn left onto Ennerdale road and a final turn left (100ft) will see arrive at our Shrewsbury office. Directions when travelling from the M6 north: Head south along the M6 motorway. At junction 14 take the exit towards Stafford North. After 0.2 miles exit the roundabout on to Creswell Grove/A503. Continue for nearly 2 miles, turn left onto B5405. Continue for 5.8 miles, then turn left onto Newport Road/A519. After 4.5 miles at the roundabout take the 2nd exit onto Forton Road/B5062. After 0.8 miles take the sharp turn right on to Chetwynd road and then a turn left after 400ft onto Edgmond Road/B5062. Carry on along the B5062 for almost 8 miles and then turn left onto Queensway/A42 then a turn right (60ft) on to B5062. At the next roundabout take the 3rd exit onto Cotwall Road/B5062. Continue for half a mile then turn left onto Shrewsbury Road/B5062. At the next roundabout take the 3rd exit onto Featherbed Lane then after 0.8 miles continue onto Harlescott Lane. Follow the road until the next roundabout then take the first exit onto Brixton Way. After two turn lefts through Ennersdale road and Ainsdale Drive the Shrewsbury branch will be on your left. For low cost car hire in Shrewsbury book online with Easirent. We have a fantastic range of new cars to choose from including small, family and executive cars at super competitive prices!